Mr Harris said the "stakes are high". The minister said he hoped after today's stoppage comes to an end, that there is a intensity of engagement to avoid further disruption. Mr Harris was speaking as more than 37,000 nurses belonging to the Irish Nurses and Midwives Organisation resumed their strike action this morning in a dispute over pay and staff shortages. He described as "regrettable" that unions feel pay reforms are not coming into action quickly enough. but he said proposed industrial action and ongoing industrial action is not the answer. Mr Harris said the Government was fully committed to "coming to a satisfactory solution for all parties involved" in accordance with the terms of the public service and stability agreement. "I hear a lot of people say a solution could be found within the agreement. I think there's a duty on people to outline how exactly they would bring that solution about, because any solution to this dispute must be affordable and fair". He said the Government had to maintain responsible, prudent handling of the public finances including public service pay, because without it, all future pay agreements could be at risk or unaffordable. Meanwhile, the Minister for Finance has said the Government is willing to enter into discussion and negotiations with the INMO. However, Paschal Donohoe said it had to be conscious that there is a pay agreement with 291,000 other public servants. He was responding to questions from opposition members in the Dáil, following statements on the industrial dispute. He said the Government had acknowledged specific issues of recruitment and retention that need to be dealt with, and that are acknowledged in the public service pay commission. "That's why we put forward specific proposals in relation to it, that we are willing to honour", he said. Mental health services are also in the crossfire - after the Psychiatric Nurses Association escalated its overtime ban to run through the night. 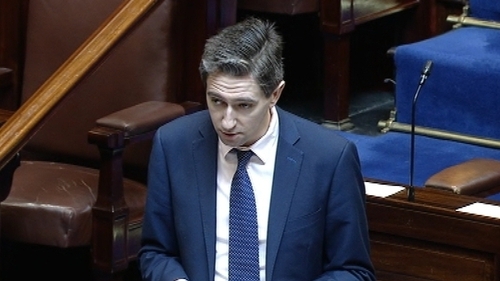 Minister Harris also said the cumulative affect of the industrial action would add to the stress of an already strained system. "It's a dangerous situation and patients will be put at risk." Sinn Féin's Deputy Leader Pearse Doherty said the Government needs to engage in negotiations with nurses without pre-conditions. inister for Children, Katherine Zappone said "something needs to shift in order to bring people to the table." Mr Doherty said there is a crisis in the health service and the Taoiseach and Minister for Health have shown themselves to be "utterly incapable" of dealing with it. Minister Zappone acknowledged that "the risks are escalating and that is why there is such significant contingency planning going on with the INMO." She said that "we need something to shift in order to bring people to the table." She said there is reasonableness on both sides and she said she has spoken to nurses about their concerns. Ms Zappone said the nurses are saying they need the issue of pay dealt with effectively to address the issue of safety but she said that on the other side that there is reason on the Government side but we need something to shift in order to bring the parties together. She said that "talking needs to begin, we require significant engagement and genuine and real intensification." Next week sees three planned back-to-back 24-hour strikes with both the PNA and the INMO taking part - and management and unions agree that will put the health service under intolerable pressure. Last night, Taoiseach Leo Varadkar told Fine Gael TDs and Senators in Dublin that efforts will be made over the coming days to find a mechanism to resolve the nurses' strike. He told a parliamentary party meeting, however, that a resolution could not expose the taxpayers or be unfair to other public servants. Mr Varadkar said there has been a lot of engagement on the dispute and this would continue.